There has been a lift in milk production this week. With just enough rain to freshen up the pasture, grass growth on the LI farmlets is back to growing above demand and the Std. farmlets are growing just below demand because of the higher stocking rate. Feed allocations have been on target with assistance of supplement; PKE to kale herds and baleage to fodder beet herds, however this will be removed and pasture residuals and milk production monitored to make sure intake targets are being met. As seen in the feed wedges, pasture growth and covers have increased, trending closer to target. 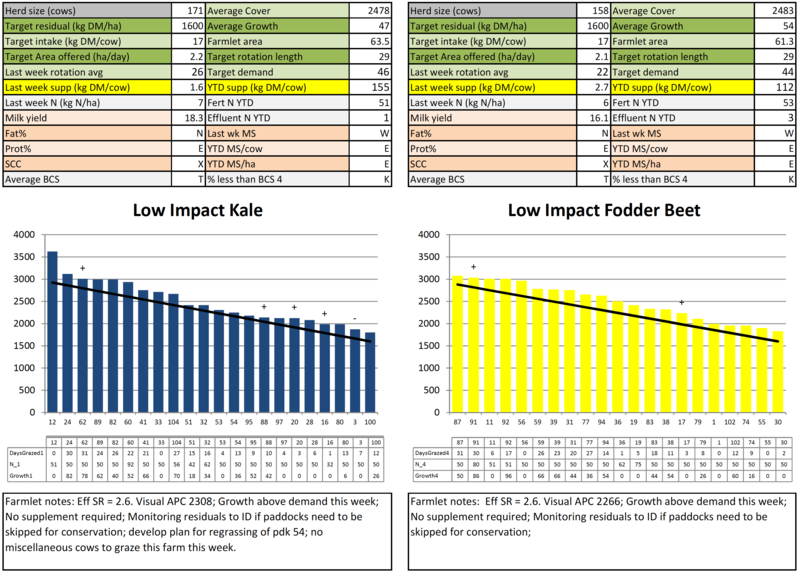 Supplements will be removed this week and residuals and pre-graze mass on a per grazing basis will be measured to determine whether additional supplement needs to be added to meet feed requirements in the Std kale and Std FB herds. Rotation length is sitting at 29-34 days with the variation due to differences in the area of pasture available (number of paddocks) between farmlets. Going forward, 24 hour grazing will be implemented on farm to ensure a more accurate allocation of pasture and reduce time spent setting up breaks. The pasture will be assessed following the first grazing period in the 24-hour break to determine actions for the rest of the paddock. If necessary herds will be put back into paddocks to achieve desired residuals or moved on if they have reached the target residual. 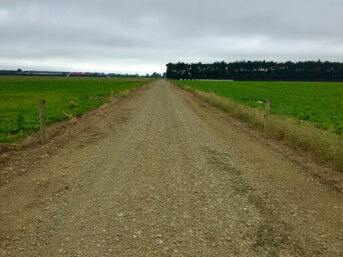 Late December/early January the majority of the paddocks in each farmlet received 25 kg N, as N-protect. This week the remaining paddocks will receive their December/January N application. This will bring all Std paddocks up to 120 kg N/ha season to date and LI paddocks to 50 kg N/ha season to date. In the next 2 weeks the decision will be made when to apply another round of N to the Std. farmlets. Leaf damage to the kale crop has occurred from spraying the redshank with a spray containing oxyfluorfen and picloram. In the diagram below you can see the difference between the leaves of the crop on the left, that was sprayed, and the crop on the right, that were not sprayed. The leaves will recover, however, there may be an effect on regrowth. Due to the weed burden, the decision to spray had to be made. The kale crop is starting to show small signs of Diamond moth caterpillar attack. This will be reassessed next week to determine if the infestation has increased and whether a spray is required. Soil mineral N samples were taken from the 2019 crop paddocks in mid October just prior to planting and have come back with some very interesting results. The table below shows that the crop to crop paddocks had significantly lower mineral N than the grass to crop paddocks. Having this information is very useful in determining the amount of N that needs to be applied to crops. With more soil N available in the pasture to crop paddocks the requirement for N fertiliser is lower. Also of interest was that the N levels were lower in the FB paddocks that were lifted at the end of winter and a paddock that have been already cropped for 2 years. This results illustrates the contribution of dung, urine and supplement N to the soil during the grazing process. 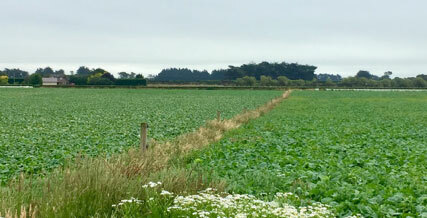 In the image below, you can also see the visual difference between the crop to fodder beet paddock on the left and the grass to fodder beet paddock on the right. 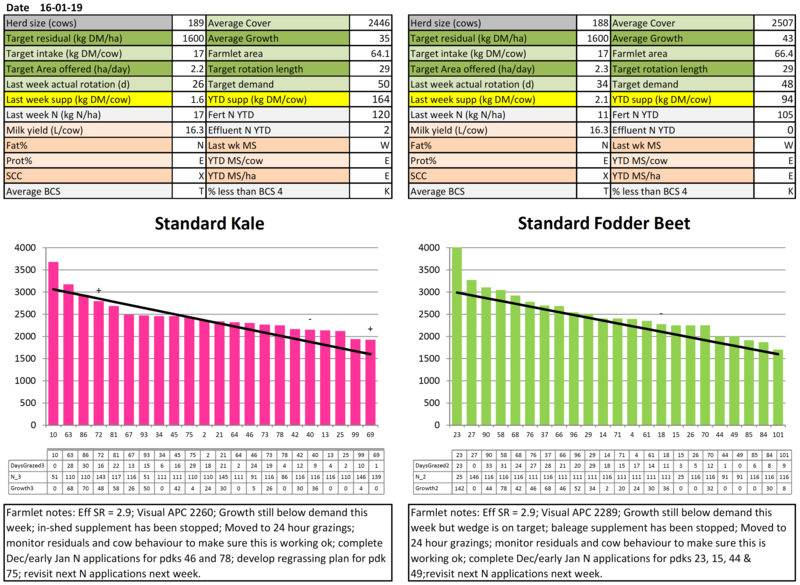 Diagram 2: On the left is crop to crop FB (pdk 35), on the right is the grass to crop FB (pdk 52). The leaves of the grass to crop FB are uniform and dark green whereas the crop to crop leaves are lighter green and yellowing in places. Approximately 15% of the calves are currently underweight and struggling at the support block. They will be re-checked and treated by the vet this week and a feeding plan developed to get them back on track. This will likely require them to be transitioned back onto pellets, with calves that are of the most concern to be transported back to the milking platform and grazed on better quality pasture. The hub is pleased with the current overall animal health of the milking herd. The peno mob is down to x3 animals and the number of lame cows is negligible. With x4 mobs on farm to walk into milking, herds are often left to walk themselves to the shed at their own speed. It is felt that this is one of the main contributors to the low incidence of lameness on the farm. In the image below, you can see the cow’s track on either side of the race. The cows have been able to pick their own line to walk, rather than be pushed to walk onto the more rocky parts of the track. The first round of interviews for the Hub manager’s role will commence next week. This week was the Farmer Reference Group (FRG) meeting. Some great ideas were fed back to the SDH team of which will be considered and actioned going forward. We would like to thank the FRG attendees and their contribution on the day. This week the science team completed the first of the measurements to look for differences in N intake and digestion between the herds. Twenty cows from each herd have been selected as monitored cows with each monitor group having the same age profile, days in milk and genetic potential. At milking on Monday pm and Tuesday am these cows were drafted out as they exited the milking platform and were run through the herringbone race in the science area where they had blood, urine and faecal samples collected. 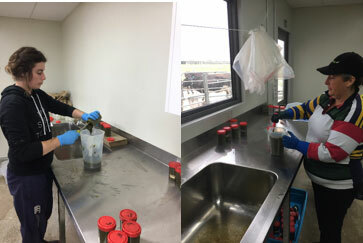 In addition a milk sample was taken during milking for milk urea determination. The team were very pleased with how the process went with the last sample cow being available to re-join her herd within 15 minutes of the last cow for that herd leaving the platform. Over the 2 milkings the team collected 160 milk, blood, urine and faeces samples which have all been packaged up and sent off for N analysis. We forgot to get some action shots while the samples were being collected but below are a few photos of the end result.